Fifty-six spellers representing grades third through eighth from 1,151 schools in 42 Texas counties, will face-off on Sat., April 1 for the 2017 Houston Public Media Spelling Bee, the nation’s largest local spelling bee. New this year, early rounds will stream live on Houstonpublicmedia.org/spellingbee at 1:30 p.m. and final rounds will air live on TV 8 and online at 7:00 p.m.
HOUSTON – (March 24, 2017) – Fifty-six spellers representing grades third through eighth from 1,151 schools in 42 Texas counties, will face-off on Sat., April 1 for the 2017 Houston Public Media Spelling Bee, the nation’s largest local spelling bee. New this year, early rounds will stream live on Houstonpublicmedia.org/spellingbee at 1:30 p.m. and final rounds will air live on TV 8 and online at 7:00 p.m. The top two spellers will advance to the Scripps National Spelling Bee held May 28 – June 2, 2017 in the Washington, D.C. area, with an all-expenses-paid trip to Bee Week. Ernie Manouse, Houston Public Media’s arts and culture senior producer, returns as this year’s host and Anjay Ajodha, three-time Houston Spelling Bee champion and one of the youngest to compete at Scripps National Spelling Bee at age 8, is returning as a special guest commentator. As part of the organization’s commitment to education, Houston Public Media conducts, hosts and broadcasts this major spelling bee competition annually. Participation in spelling bees helps students improve spelling and increase vocabulary. Bee participation also provides every student with valuable experience in developing poise and sportsmanship as well as skills for public speaking, performing arts and athletics. 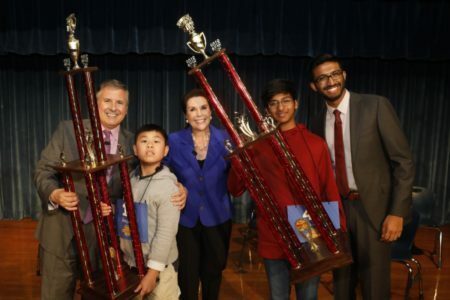 Houston Public Media TV 8 is the first public broadcast television station in the nation to conduct and broadcast a Scripps-affiliated local spelling bee. This marks the ninth year that Houston Public Media has staged this prestigious academic competition and more than five decades that this event has been held in Houston.